VietNamNet Bridge – Saigon Xuan Thanh FC on August 21 sent a dispatch to the Vietnam Football Federation (VFF) and the Vietnam Professional Football JSC (VPF) on its withdrawal from the V-League. The boss of Saigon Xuan Thanh FC - Mr. Nguyen Duc Thuy. The decision was made to oppose the VFF's disciplinary decision to dock the club four points. The committee confirmed that the team featured too many young players and played well below their ability, especially in defense, during a fixture against Kien Giang. Because of the deduction, the HCM City-based FC faced the risk of relegation and it denied those accusations and sent a document to the media opposing the VFF's decision. In the document, the club stated the decision made unfairly and without transparency and would not aid the development of Vietnamese football. Nguyen Xuan Thuy, chairman of the club, said VFF authorities had not been able to single out any player or group of players who performed below their ability. Meanwhile, the chairman of the VFF, Nguyen Trong Hy, said that the club should not arrive at a decision recklessly and urged them to instead lodge an appeal. Finally, on August 21, the FC announced in written document its withdrawal from the V-League. The content of this document is similar to the first document. It said: "One of the goals of the team in this season is to train young players in order to reduce costs in the context of economic difficulties. Regrettably, the use of young players led to the unexpected results in the game against Kien Giang and it became an excuse for the disciplinary board to deduct 4 points." According to this dispatch, the decision is just to "hide the VPF’s weakness of organization." Saigon Xuan Thanh FC also listed a series of matches which they saw "negative signs" in the 2013 V-League but the disciplinary board ignored. The club also stated that it repeatedly complained about the situation that one boss owns several football teams but VFF has not handled it thoroughly. Saigon Xuan Thanh said because of the above reasons, they "no longer had trust” on the VFF, VPF and the Disciplinary Committee so they decided to leave the V-League. The club said that the decision of the Disciplinary Board discredited its image, affected the prestige of HCM City’s football and asked VFF to reconsider the decision. Saigon Xuan Thanh said they would remain practice to prepare for a tournament in Uganda in October 2013. Kien Giang FC also threatened to withdraw from the V-League after VPF General Director Pham Ngoc Vien said that the team ranks 11th at the V-League will be still down-ranked after Saigon Xuan Thanh’s withdrawal. Vien said: "If Saigon Xuan Thanh quits, the FC with the lowest score which ranks 11th will be relegated despite the rules state that the 12th team at 2013 V-League will relegate." Upon receipt of the above information, Kien Giang organized an emergency meeting. It argued that according to the charter, the 12th team is relegated. If Saigon Xuan Thanh leaves the V-League, it means that they do not have points, not rating. Even if Kien Giang loses in the next two games to rank 11th, it cannot be relegated because the charter says that only the 12th team is relegated. In addition, according to the charter, if a team quits, the VFF and VPF have to hold a meeting to make rational decisions. Vien’s statement is inconsistent with the principle, causing confusion for Kien Giang FC and its fans. "We're still trying to play the remaining two games in order to stay with the V-League in the next season. If the organizing board insists that the team ranks 11th to relegate, we will give up the two last game," said Kien Giang’s coach Lai Hong Van. 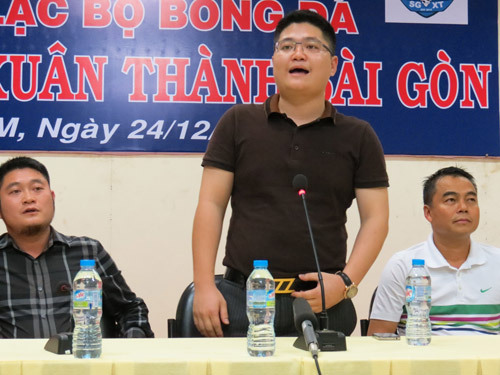 At a meeting of VFF and VPF yesterday, August 22, Mr. Tran Duy Ly, chief organizer of V-League denied Vien’s statement, saying that the team ranking at the bottom after Saigon Xuan Thanh’s withdrawal will not be relegated. However, Ly said that this was just the idea of the organizing board and the final decision would be made by VFF. At this meeting, VFF and VPF approved the withdrawal of Saigon Xuan Thanh FC.